Update to 1.2.2.1 does not appear to be working! I updated to 1.2.2.2 shortly after it was released but after seeing the problems others were having (and confirming at least some of them myself) I decided to roll back to 1.2.2.1. Prior to rolling back from 1.2.2.2, I saved the entire "Aerosoft" add-on folder, as I typically do to preserve my liveries and aircraft.cfg edits. As a result, and after installing v1.2.1.0 as downloaded from the Shop, I've found that although the Updater did download and install some files and now claims that I have the latest version (1.2.2.1), I have discovered at least a few files where my currently installed files are older than my backup files. It seems as though the Updater is installing outdated packages? 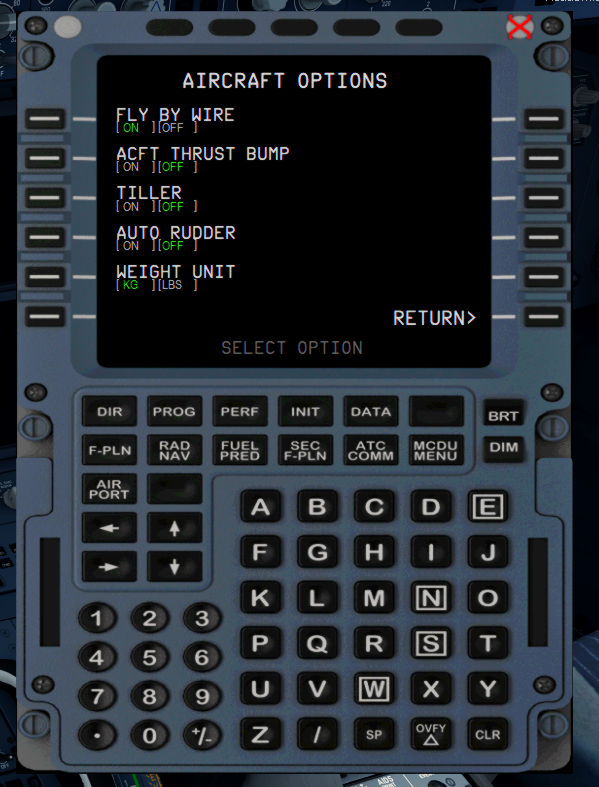 What led me to discover this was the absence of the "Weight Unit" setting under MCDU3 > Options > Aircraft. For that instance, restoring my backup MCDU2a.xml and MCDU2b.xml files restores the feature. I've also found some other files which aren't being updated (see below). I haven't searched exhaustively, so there may be more? The A320-A321 installation is an identical situation, except MiscD2D.dll has a matching date. Attached are my log files for the most recent update attempt, in case they are useful. I suggest doing a clean install of the released version and update that one. Sorry chaps but I’m totally and utterly confused by this! It seems like the last update was a disaster! Presumably, it has been withdrawn, so what version should we go back to? Then update it to what! Oh I don’t know I’m just sick of all this! I’m now bloody sure I don’t like being experimented on! Seems to me we’re one step forward, two back! For goodness sake get a grip of this project, if for nothing else your customers sanity. I've done that a total of 3 times already; each time has resulted in the same. Changing the version number in the text file in the Updater\Products folder back to 1.2.1.0 also triggers the same faulty update (tried that twice). Are there files or registry keys that I should be removing after running the uninstalls? (Or a way to manually update?) Throwing those old files in there fixes it, but unfortunately they are 1.2.2.2 so I can't just copy the whole batch right in and run from there, at least until (presumably) a fixed 1.2.2.2 or 1.2.2.3 comes out. I had also experimented with deleting prepar3d.cfg (same results) and toyed with a client reinstall but it's pretty clear to me that P3D itself is not at issue unless it's somehow impeding the Updater. I think the completed version of this project is now way overdue. Really? And exactly what thought process lead you to this belief? I really want to know, because I'm feeling overwhelmingly offended by your statement. So, you checked the "EXPERIMENTAL" box. Yup, I get it, everyone wants the latest and greatest version, or should I say the latest STABLE version. Which is 1.2.2.1, when you proceeded to install the experimental version, you agreed to the terms. Are there any thoughts as to why when using the Updater a total of 5 times (3 "clean" reinstalls and 2 "attempts at fakery"), I don't seem to be getting all of the updates? Perhaps by not checking "Show ... experimental updates...", I'm only getting the 1.2.2.0 and 1.2.2.1 updates on a clean install and not the incremental updates between 1.2.1.0 (the store download version) and 1.2.2.0? I can't know that for sure since the Updater application isn't very transparent in terms of settings. In the absence of any guidance as to something I may be doing wrong, this seems to be exposing some general limitation of the Updater application regardless my situation. If that is the case, perhaps 1.2.2.0 and 1.2.2.1 should have remained "experimental" and 1.2.2.2 pulled altogether. Maybe it would be a good idea for the Updater to have a backup and/or rollback option for the files it is proposing to update with a given package, given the real potential for something to go awry with both experimental and supported updates. Yes, I'm kicking myself for not fully backing up the working 1.2.2.1 setup, but given that official support has identified a way around it wouldn't seem that such a hangup I am experiencing should be possible or acceptable. It's all working fine now. Have you checked your file modified dates? Mine "works fine" too, but who knows what unsolvable support issues will pop up when you are missing several interim patches. I'd rather not find out! In the Aerosoft updater at konfig box empty. Open the file as_a318_a319_prof.xml and save it as version 1.2.2.2 modified in 1.2.2.0. Then the updater started. This reports new version and then downloads the version 1.2.2.1 down. In the directory Logs delete the Log.txt file with 1.2.2.2. Everything is the same with me again as before. Then I did the same with 320-321. Im Aerosoft updater bei konfig Kästchen leer. Die Datei as_a318_a319_prof.xml öffnen und als Version 1.2.2.2 geändert in 1.2.2.0 , abspeichern. Danach den updater gestartet. Dieser meldet neue Version und lädt dann die Version 1.2.2.1 runter. In den Verzeichnis Logs eventuell die Log.txt Datei mit 1.2.2.2 löschen. Bei mir läuft alles wieder so wie vorher. Danach habe ich dann das gleiche mit 320-321 gemacht. It also confirms my suspicions about the Updater. Therefore the preferred method, should not be to clean install but to fake out the Updater to overwrite the 1.2.2.2 update with 1.2.2.1 as Bernd suggests. If you clean installed, then update allowing experimental updates and then proceed with Bernd's process from that point. I've noticed by the logs that doing this will not replace the 1.2.2.2 MCDU2b.xml and MCDU2C.xml files, but I'm not expecting that to be much of a problem. Am I correct in saying that if you don't do a clean install, ie just use windows un-install and leave the folders and files left over behind. A re-install achieves the same result. 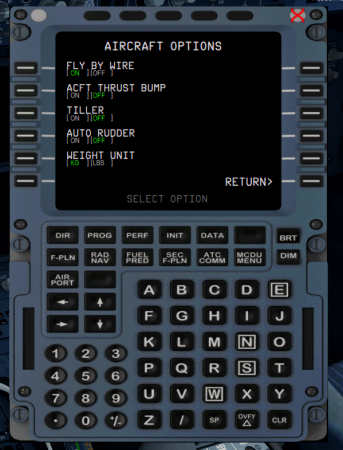 If you find, like I did, that there is no entry in the Control Panel/Programs and Features applet for the Airbus, you'll find the uninstaller where you installed your Airbus. Please do not simply delete the Airbus folder or try to install over it. You have to use the uninstaller to get a clean result. Thank-you for the clarification Herman. all i can say is i hope they're working on it.. in the mean time at least i have my pmdg's to fly. i really wanted to continue learning the airbus tho. Also missing the kg/lbs option but not too worried as im sure it will get fixed later ...done a lot of flights with out that option any way. More than happy to apologise for offending you. I don't think you should be replying to me, I am not the one asking for assistance. Thanks for the report guys. It's a mystery for sure as it was there before. Anyway, I'm running (testing) the latest update and it works fine. We're trying to improve some routines in the FMGS and as soon as we've achieved that then we'll get the next update out. We will have a new full build next week.